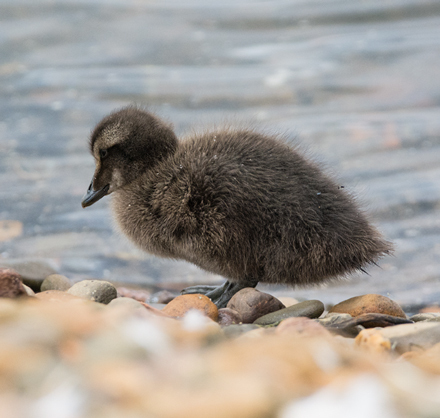 Fed and watered at Morrisons, we arrived at a blowy Whitesands to find the shoreline rather devoid of birds apart from a few female Eider with their chicks. 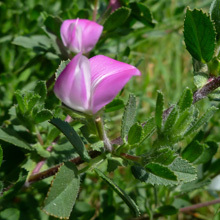 We were drawn though to the local flora. 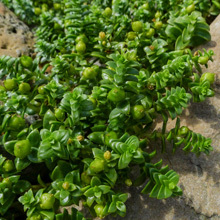 Sea Sandwort was in fruit. 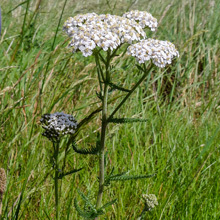 At the edge of Dunbar golf course (technically, in the rough!) 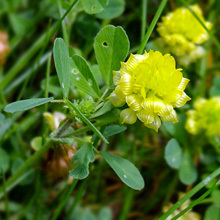 we spotted a lovely patch of Wild Thyme which I photographed after the golfers had passed through. 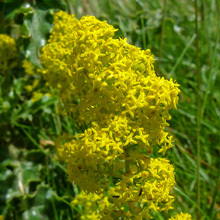 On a bush in the dunes a male Reed Bunting sang its heart out as I snapped an image of some Lady’s Bedstraw. 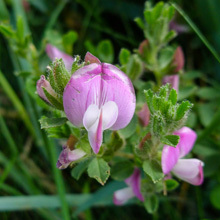 A beautiful patch of Common Restharrow also bordered the dunes, with some Hop Trefoil and Yarrow. 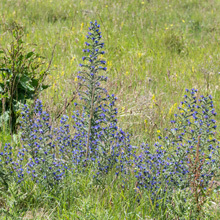 It was decided to move on to the Barns Ness car park where we immediately spied a very bonny clump of Viper’s Bugloss. 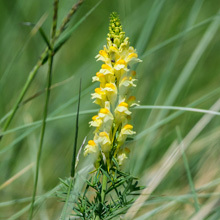 The close up shot shows that it's a stunning flower (see Pictures of the day below). 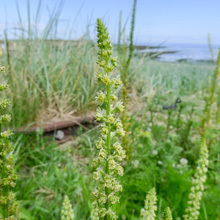 We walked around the shoreline as the tide crept in. 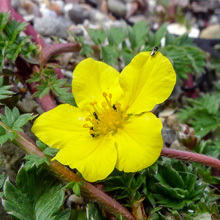 I took a picture of some nicely exposed Silverweed showing its deep red rhizomes and vivid yellow flowers, often confused with buttercups. 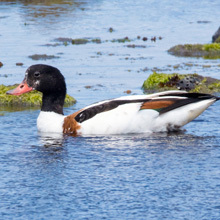 We spotted a chirping Rock Pipit and at a series of rock pools a pair of Shelduck fed tentatively as we slowly passed by. 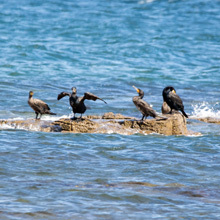 Offshore a family of Cormorants were using a rock as a base between bouts of fishing. 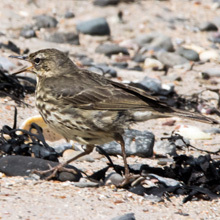 Again it was very quiet on the beach – perhaps the high wind kept the birds away, or maybe they were sheltering further out, or perhaps it was the Sunday walkers. 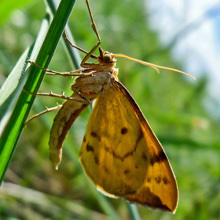 Anyway, we next headed for a wooded area sheltered from the windy gusts. 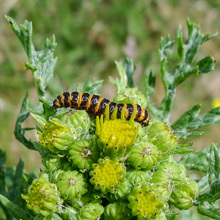 On our way there I came across a Cinnabar moth caterpillar feeding on Common Ragwort. 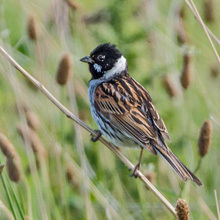 John then took a photo of a Reed Bunting as I photographed a patch of tiny white Fairy Flax. 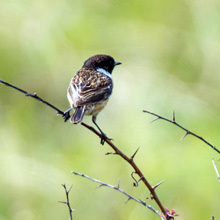 A Stonechat appeared briefly, precariously perched on a distant wind-buffeted bush. 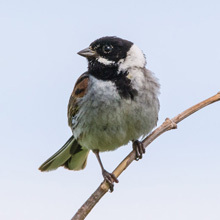 It was so windy I had to rest my camera lens on John’s shoulder to get a steady shot. 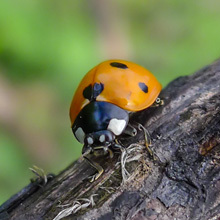 In the relative calm near the trees John saw a few 7-spotted Ladybirds on some burned out bushes. 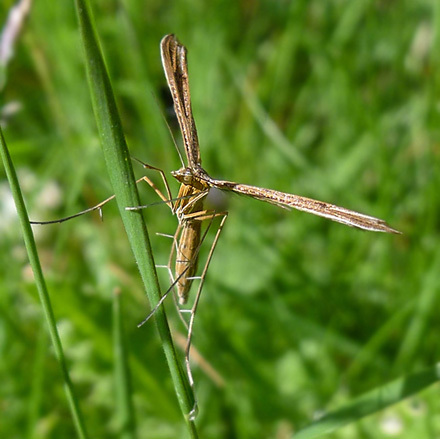 Then, flitting between stalks of grass he pointed out a Common Plume Moth which seemed almost Stick-insect-like. 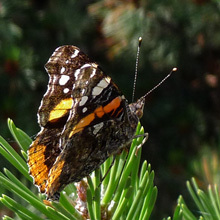 I crept up to capture an image on my macro camera of a Red Admiral butterfly perching on a conifer, but higher on the tree a Painted Lady butterfly needed my 600mm lens to get a decent shot. We returned to the car for a wee cup of tea with pastry lattice. 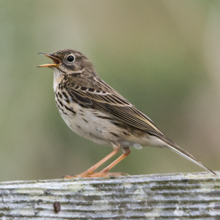 It had been a great day for flowers and insects but rather disappointing for birds. But that's how it goes. 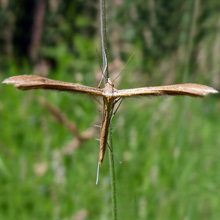 Pictures of the day were the Viper’s Bugloss and the Common Plume Moth. 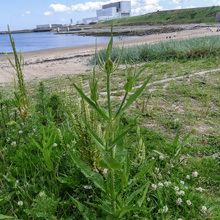 The weatherman was promising sunshine across Central Scotland with the best in the east so after our usual breakfast we headed for Skateraw, the sandy cove adjacent to Torness Power Station in East Lothian. 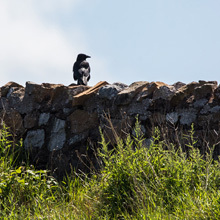 On arriving there we were met by a lonely Carrion Crow on a high wall above the old lime kiln. 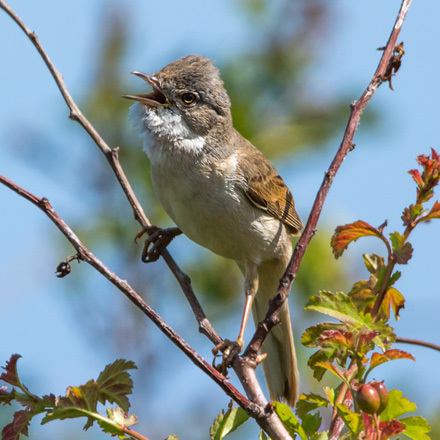 Soon I was engaged in a battle of wits with an excited Common Whitethroat as I manoeuvred myself into a position with the light behind me. 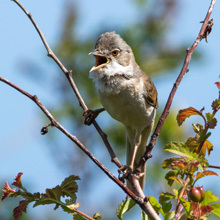 Once I got a couple of shots I moved on as I didn't want to upset him too much as he obviously didn't want me about. 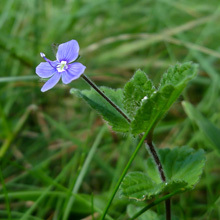 Above the lime kiln I noticed patches of Restharrow and John pointed out some Germander Speedwell. 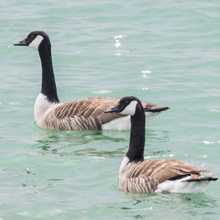 We decided to move to the rocky area at the west end of the bay where we saw bird activity. 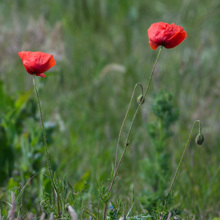 On the way there we noticed Red Poppy and Common Toadflax. 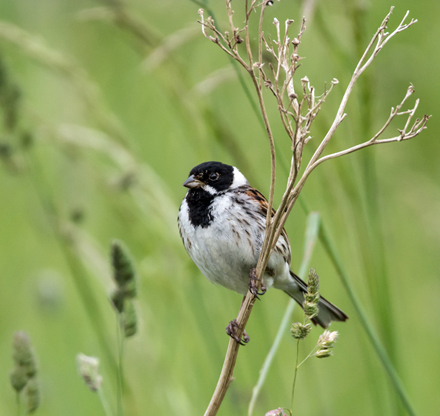 We were watched by a courting Reed Bunting as we trudged through the long grass before approaching the shore very tentatively trying to avoid putting up any birds that could have been there. 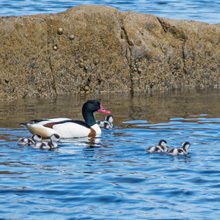 Sure enough, swimming in the rock pools was a family of Shelduck with no less than 11 young. 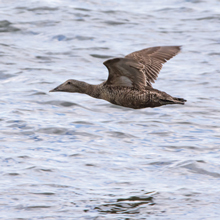 We watched as they slowly made their way across the rocks and into the Bay. 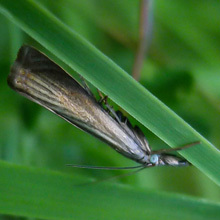 In the grasses around a small monument to a Youth leader I took some pictures of several moths - Cinnabar caterpillars, Barred Straw and a micro moth, Chrysoteuchia Culmella. 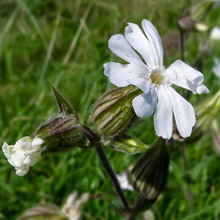 I also found two types of the wildflower Campion, White Campion and Bladder Campion (see Pictures of the Day below). 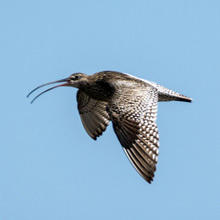 A Curlew passed overhead as it searched for a good spot on the shore, followed by a Grey Heron which had been disturbed by paddlers. 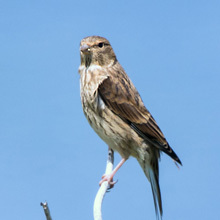 On our return journey we were followed by a female Linnet, no doubt watching that we avoided her nest. 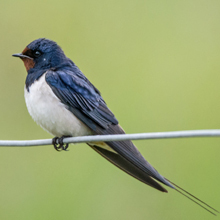 At the bungalow by the beach a lonely Swallow rested on telephone wire. 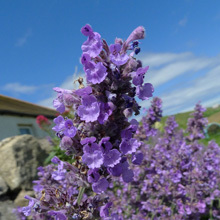 The wildflowers around the house made a very attractive sight. 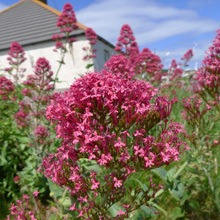 There were large patches of Red Valerian and Catmint with smaller patches of Weld and Teasel. 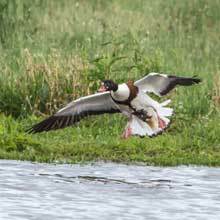 We moved back west to Belhaven Bay to check out Seafield Pond. 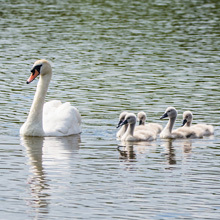 There we came upon a family of Mute Swans with half a dozen cygnets. 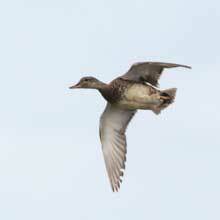 As they moved off the sandy area we noticed an odd-looking bird that was probably a female Garganey. 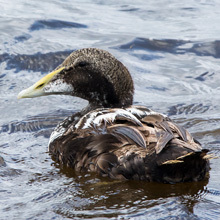 The jury is still out – some say it is a hybrid, others a female Mallard. 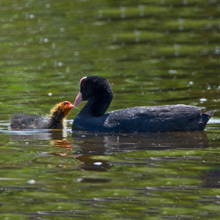 Nearby, a baby Coot constantly pestered its parent for food. 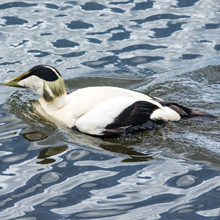 As we watched these birds a large fish swam on the surface close to the pond edge. 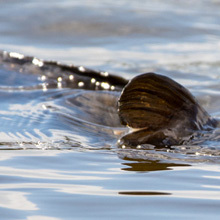 Eventually we noticed a further two fish stationary beneath the surface. Just what they were up to, we just don't know. 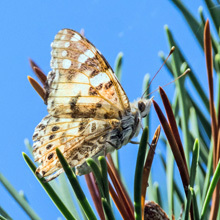 We returned back to the car for a spot of tea and lattice pastry where we reflected on a very enjoyable and varied day and discussed the pictures of the day. 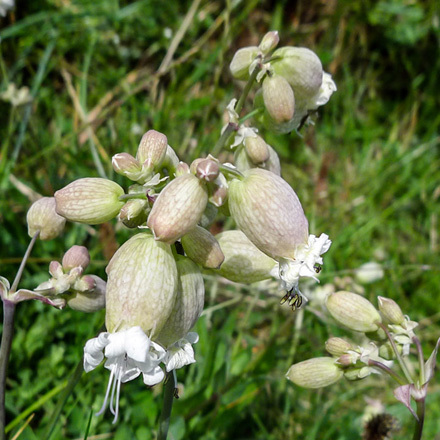 I chose the Bladder Campion and Common Whitethroat. We had such a good time we got home a half an hour late – a fact not missed by our wives! 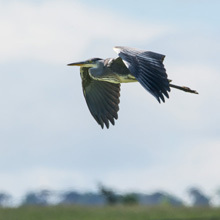 There was light cloud across the Central Belt of Scotland, with the odd chink of blue that gave us hope that we'd get some sunny spells. 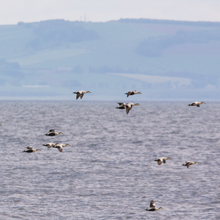 We headed for Musselburgh although we had no word of any special sightings – we just like Musselburgh. 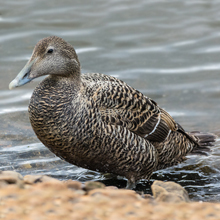 At the Scrapes we were disappointed to see it looked overfilled with water which probably explained the absence of waders. 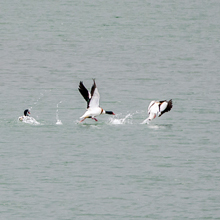 Three Gadwall flew in and immediately stirred one of the several Shelduck into action. 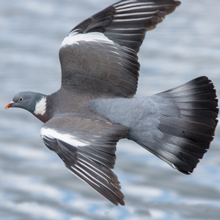 It flew over to the visitors encouraging them to move on. 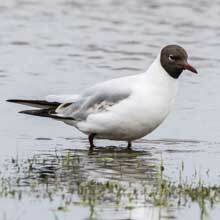 Meanwhile, a Black-headed Gull went about it's business. 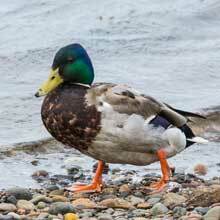 We decided to move to the seawall and hope for more action there. 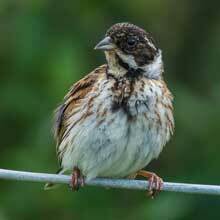 A Reed Bunting whistled plaintively on the fence as we left the Scrapes. 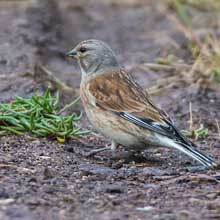 All we saw at the seawall was a couple of Linnets before a shower of rain forced us back to the car. 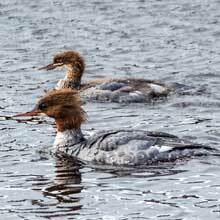 We then drove round to the mouth of the Esk where we found large numbers of Goosander in the water and lazing about the shore. 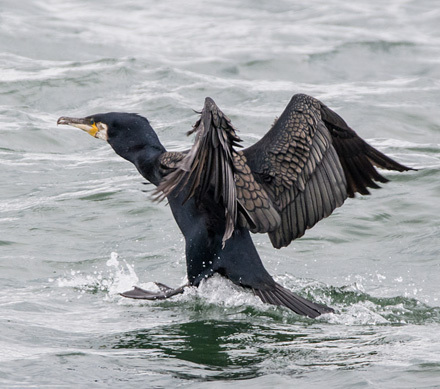 Some were immature but were diving as keenly as the adults. 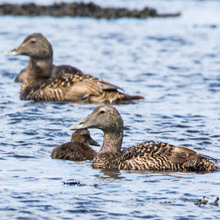 A few Eider were also in the water with their young. 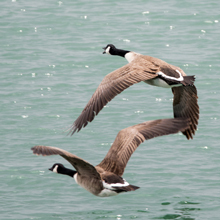 A flock of around 20 Canada Geese glided past us, carelessly scattering any smaller birds in their path. 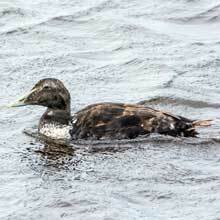 Eider and Mallards in eclipse plumage sat preening on th shore until a passing fisherman disturbed their peace. 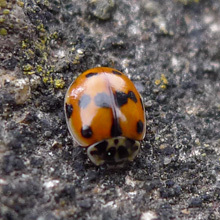 On the seawall, a tiny 10 spot Ladybird sheltered from the strengthening breeze. 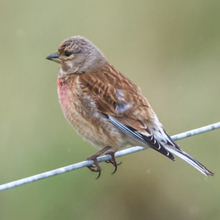 At this point the rain was moving in again so we decided to drive along to Port Seton Harbour. 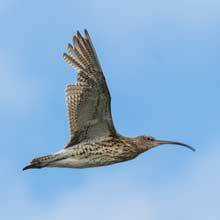 As we made our way back to the car a bold Curlew flew low overhead, probably heading for the Scrapes. 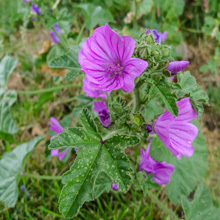 A male Eider toddled past us as I captured an image of some Common Mallow at the pathside. 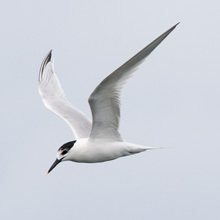 At Port Seton we walked around the harbour attracted by the croaking of Sandwich Tern fishing offshore. 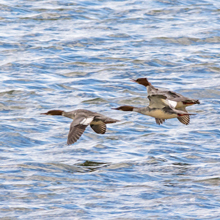 Eventually one passed close enough for a decent shot. 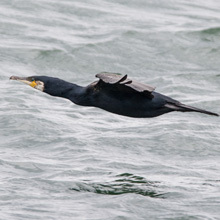 A Cormorant then flew in just as half a dozen Canada Geese flew past. 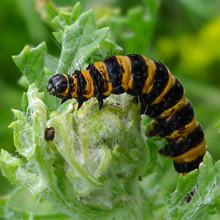 It had been a bit disappointing with only the ”usual suspects” gracing us with their presence. 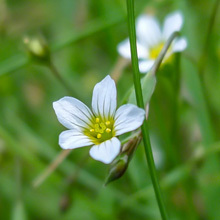 However, as described, there were a few points of interest. 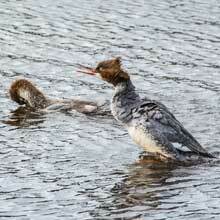 Our shots of the day were of the Port Seton Cormorant landing on the sea and the juvenile Goosander. As a bit of consolation, we each downed a couple of Chocolate Eclairs with our customary cuppa. Well, any excuse will do for a wee bit of confectionery! 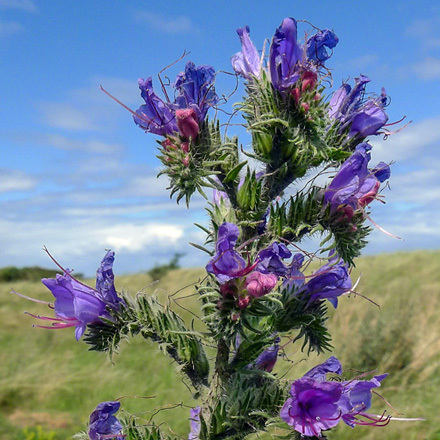 After we consumed breakfasts in Dalkeith Morrisons (9.5/10 – leaky teapot), the weather app on my phone lead me to expect fair weather further to the east so we headed for Barns Ness. 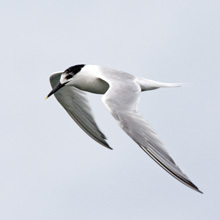 However there were frequent light showers from when we arrived there and the light was poor. 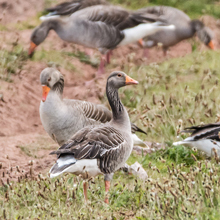 At the Cement Woks there were large flocks of Greylags and Canada Geese and a few squabbling Shelducks. 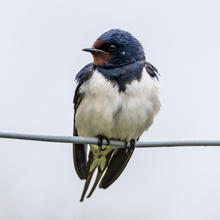 As I drove past the Whitesands car park a very obliging Swallow posed as John snapped a few shots from the passenger seat. 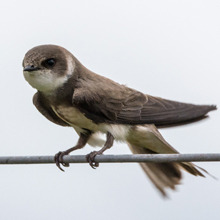 A bit further along I managed to snap a Sand Martin from my side and also a Skylark in the grassy bank. 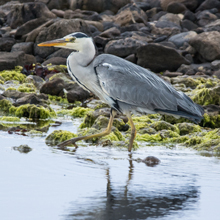 We parked the car at the Barns Ness car park and headed for the Lighthouse and as we reached the seashore John spotted a Grey Heron fishing in the rockpools. 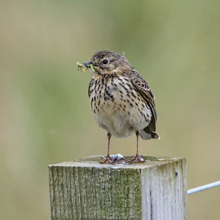 Just as we were getting into our stride the rain came on – not good for expensive camera equipment! 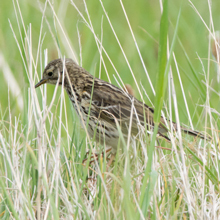 We headed back to the car, sneaking shots of Meadow Pipits and Linnet on the way. 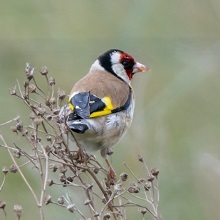 As we sheltered in the car we watched a pair of Goldfinches feeding in the long grass. 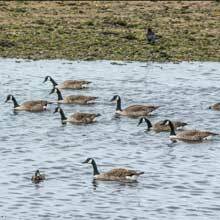 After consulting my naughty weather app it was apparent that Musselburgh was enjoying dry weather so we decided to cut our losses and head there. 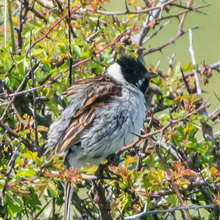 Again as we passed Whitesands John captured some nice shots from the passenger seat of a Reed Bunting and a Swallow. 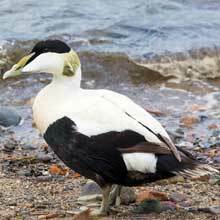 We drove via Port Seton where we saw a huge flock of Eider travelling east. 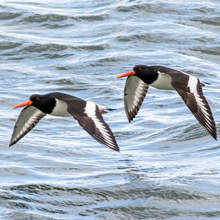 At the sea wall by the mouth of the Esk, Musselburgh, we finally got to stretch our legs as the many small groups of the ubiquitous, noisy Oystercatchers were coming and going with their usual haste. 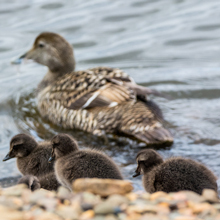 We startled a pair of Wood Pigeon as we leaned over a fence to get pictures of a family of Eider resting on the water's edge. 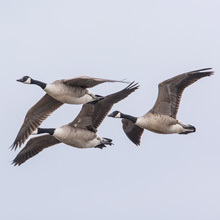 They soon spotted us and made off for a safer place. 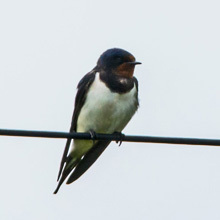 As the light worsened, it was apparent that the rain was not far away, however I managed some shots of a few more birds. 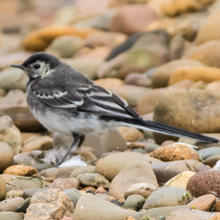 I caught a juvenile Pied Wagtail as it flitted on the shore just as a small flock of Goosanders flew in. 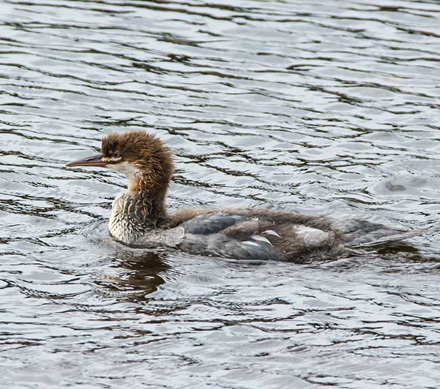 They looked like females, but some may have been juveniles. 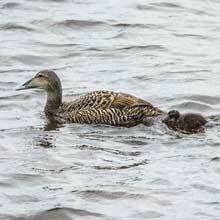 A female Eider flew past towards the family we'd just viewed. 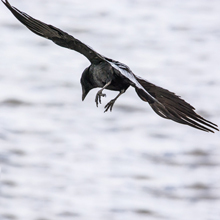 My final shot was of a Carrion Crow smashing shellfish by dropping them onto the rocks. Considering the weather we were fairly happy with our haul of pictures. 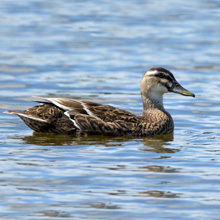 We managed to down our tea and lattice buns sitting by the car reflecting on another enjoyable trip. 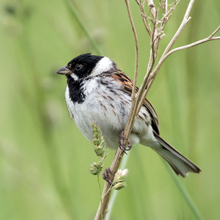 My pictures of the day are of the Reed Bunting (taken by John) and an Eider chick.